Our company functions as a problem solver, innovator, and best total cost provider, not merely a sales organization. The term “solutions” is not a separate component but an integral part of our market approach to the Power, Refining, Chemical, Food & Beverage, Oil & Gas, Heavy Industrial, Water & Wastewater Treatment, and HVAC & Institutional markets. Customer problems in steam, water, and process control are solved through a combination of staff expertise, experience, and a wide breadth of specialized products from top manufacturers. If you are visiting our website as a customer, we want to thank you for your business and we look forward to serving your future needs. 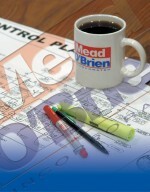 If you are not an existing customer and wish to know more about what Mead O’Brien can offer, please contact an office near you and enjoy visiting our website. In partnership with our employees and principals, we provide process solutions with value added premier products and services that exceed our customer expectations.